Gerhard Plenert, Tom Cluley, "Driving Strategy to Execution Using Lean Six Sigma: A Framework for Creating High Performance Organizations"
Many organizations develop strategic plans that gather dust on bookshelves. 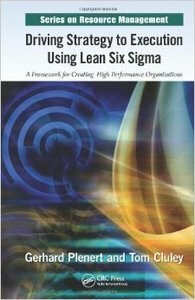 Many other organizations employ Lean and Six Sigma methodologies to eliminate waste and reduce process variation only to find they are not moving the big bars that measure success for the organization. Driving Strategy to Execution Using Lean Six Sigma: A Framework for Creating High Performance Organizations details a framework for leveraging an organization’s Lean Six Sigma capability in a manner that drives their strategic plans to execution by linking their strategy deployment into the fabric of their day-to-day operations. The framework provides a proven methodology that takes a systems approach to creating high performance. It presents the core process of strategy development and SA&D with the governing process of driving the right metrics through a balanced scorecard approach focused on the organization’s value stream. It then combines this with the enabling process of change management and the creation of a culture of problem solving, waste elimination, and internal discipline to standard work. Anyone can write a book on the procedures behind "Strategy" without understanding the key drivers that give a strategy excitement, commitment, and fire. Here, Gerhard Plenert and Tom Cluley do more than that. First, they examine how to make a strategy meaningful and powerful. Then, they underline the critical piece to strategy development—the execution piece—which takes the glossy strategy brochure off the shelf and makes a usable and executable plan. The book focuses on how to build great strategies and includes examples of what makes them great. It demonstrates how a well-developed strategy generates excitement within an organization, offering you the tools to navigate and design a workable and achievable plan for success for your organization.